So you bought an intranet, now what? This article is the second of a three part series providing tips on how to run a smooth and successful intranet project. In Part I, we discussed Determining Project Deliverables and Using an Intranet Project Checklist. The next step in intranet implementation is resourcing. Representation: Which departments need to be represented on your intranet team? Team distribution: Is the intranet team located in the same office/city? Or are the distributed across different cities, locations, or time zones? Resourcing: Does this team have dedicated time to work on your intranet project? What amount of time will people have to work on it? Accountability: Who is leading the project? Who is ultimately accountable? Responsible: This is the person who does the work to achieve the task. They have the responsibility for getting the work done. As a general rule this is one person; e.g. a business analyst, a project manager, a developer, or a graphic designer. Accountable: This is the person who is accountable for the task at hand. This must be one person and is often the intranet business owner or the project sponsor. This is the role that is accountable and approves the work that is being done. Consulted: These are the people who provide you with information for the project and with whom there is two-way communication. This is usually several people, often subject matter experts. In your intranet project, your HR staff or IT support engineers may form part of your RACI as consulted project members. Informed: These are the people who are kept informed about progress and with whom there is one-way communication. These are the people who are affected by the outcome of the tasks and need to be kept up-to-date of what is going on. Here is a sample RACI matrix illustrated with a fictitious example. 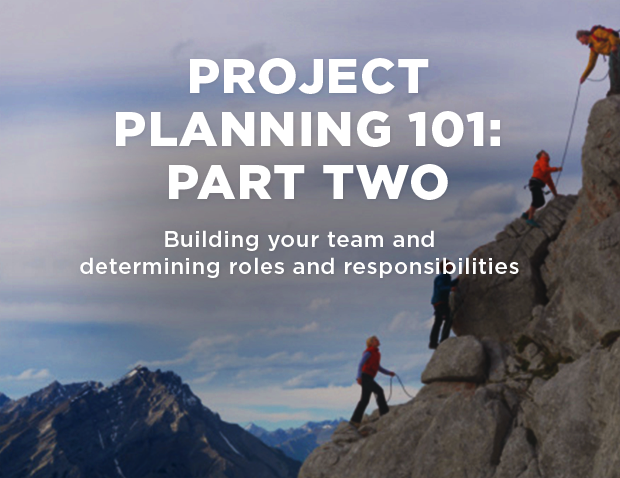 Without clearly defined roles and responsibilities it is easy for projects to run into trouble. When people know exactly what is expected of them, it is easier for them to complete their work on time, within budget and to the right level of quality. To learn how to schedule your project and create a timeline, read Project Planning 101: Part Three. If you need a refresher to remember how to determine your project deliverables, read Project Planning 101: Part One.